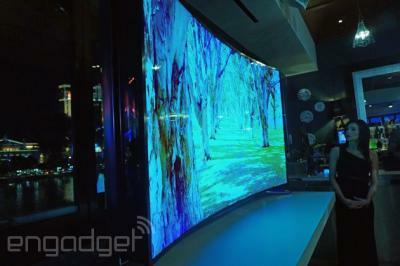 During CES, both Samsung and LG introduced bendable TVs. 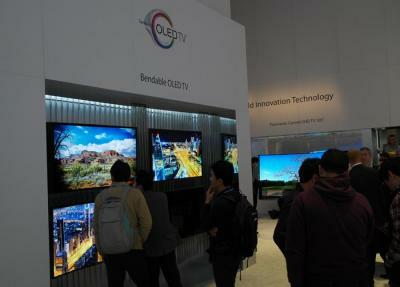 LG showed a 77" bendable OLEDs, while Samsung showed 55" bendable OLEDs and a 85" bendable LCD. DisplaySearch posts that they were surprised at first to see a bendable LCD as they expected such designs to be achievable with OLEDs only. According to DisplaySearch, only the LCD panel is bendable in Samsung's prototype. The backlight remains flat in Samsung's TV. This can create lighting non uniformity. There are some solutions, but it seems that one drawback is that the TV can only be used in two modes - flat or curved. You cannot choose your own curvature. OLED bendable TVs do not have this restriction. From DisplaySearch's article, it also seems to me that this is a very expensive design (they speculate that Samsung actually uses two LED arrays, one used for curved mode and one for flat mode). As DipslaySearch says, this leads many to conclude that OLEDs are the only real bendable TVs. In my opinion the bigger question is why customers should actually buy these bendable TVs. Aside from the novelty factor I cannot think of too many reasons for actually paying extra money for one of these. True about the coolness factor. However I wish LG and Samsung would worry less about coolness and about wowing people at trade fairs and more about developing OLED products that fulfill substantial customer needs. "If you have to explain to your customer why he ought to desire the main feature of your new product...forget it and try rethinking your product design process instead." If manufacturers didn't take a chance, we'd still be watching on fat TVs instead of flat screens. I think people got their mouths soured by how manufactuers tried to shove 3D down everyone's throat. I, for one, like passive 3D (seriously Samsung enoughs enough). I remember when people said 1080p TVs were a waste of money and 720p was fine (and I disagreed with them wholeheartedly). I'm really excited by OLED TVs. My biggest reasons for this are to get rid of LCD backlight bleed and get some true blacks. And I won't have to baby a plasma or suffer from active 3D headaches. The point I want to make is that most TV upgrades are in geek speek (e.g. 720p - 1080p). The general public is stupid. Curved TVs help viewing angles and contribute to the science of watching. It's not just something cool or something subjective like 3D. Bendable TVs will be an option like if your TV's mount swivels.